Wolf Teeth - So Why All the Fuss? A horse has many teeth, of several types and this has been discussed in previous articles. One that commonly causes alot of confusion for horse owners is the wolf tooth. Wolf teeth are a vestigial tooth (this means they are a tooth that is no longer necessary) and can be thought of abit like wisdom teeth in people. Fossil records show that the ancient ancestor of the modern horse (Equus Caballus) was the size of a dog and survived on a very different diet to today's horses. Eohippus or the "Dawn horse" ate low bushes and shrubs and had small cheek teeth similar to those of humans. Whereas modern horses generally have six cheek teeth in each arcade Eohippus had seven. As the horse's diet changed (to grass) and horses grew bigger so their teeth increased in size to provide a larger chewing and grinding surface. When this happened the 1st cheek tooth (the wolf tooth) was no longer required and gradually began to disappear over generations of horses. Today, millions of years later, many horses still develop wolf teeth; they generally appear just in front of the other cheek teeth and come in many shapes and sizes. Horses can have them on both their upper and lower jaws although lower wolf teeth are less common. There can be a tooth only on one side of the mouth or both, and the teeth can have single or multiple roots. Sometimes wolf teeth will erupt in unusual locations or fail to completely erupt (these are usually referred to as blind wolf teeth. These frequently cause bitting issues as they sit further forward in the mouth and are covered with a sensitive layer of soft tissue, they are often missed without a detailed oral exam as they are much harder to see than an erupted tooth. When the adult cheek tooth erupts behind a wolf tooth, enzymes are released that will sometimes cause the destruction of the root of the wolf tooth, this can lead to a mobile wolf tooth. 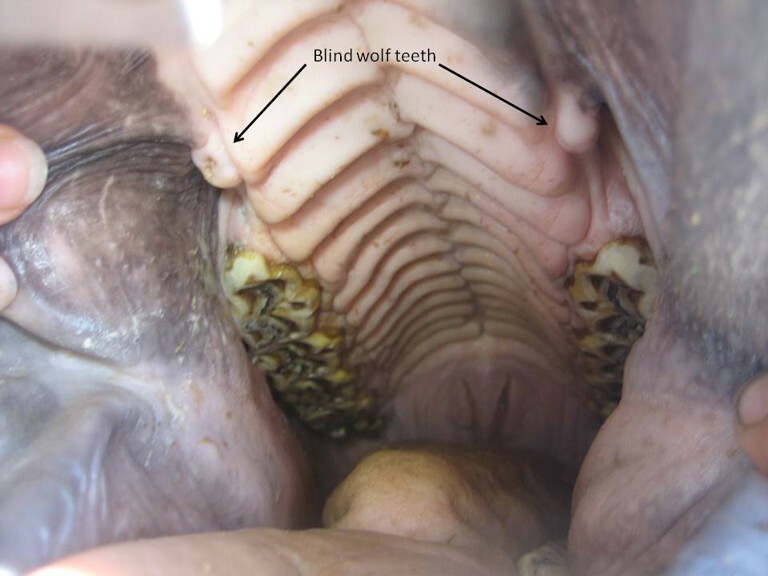 Wolf teeth generally cause few problems for horses in the wild, however with our domestic horses when a bit is placed into the horse's mouth, contact between the bit and the wolf teeth can cause the horse pain and sensitivity. For this reason Dental vets recommend removal of wolf teeth at a young age. It is far easier to remove a wolf tooth when a horse is 6-12 mths of age than as a horse ages. This is because the newly erupted tooth hasn't yet begun to fuse to the surrounding bone of the jaw (a process called ankylosis).Removal at this age also ensures that the teeth have been removed prior to any form of mouthing. Wolf teeth, like all teeth, contain nerves and blood vessels, for this reason they should always be removed after the sensitive nerves have been desensitised with anaesthetic. It is always the goal to remove (extract) the complete tooth, however sometimes this may not be possible. It is never acceptable to deliberately fracture a wolf tooth, doing this can leave nerve tissue exposed and lead to extreme pain for the horse. 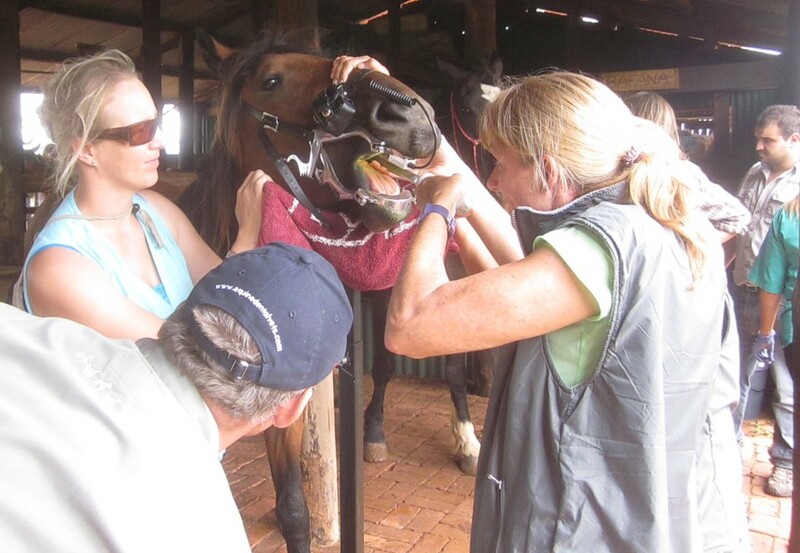 (Sometimes owners will observe that their horse has a serious behaviour change following wolf tooth fracture). Wolf teeth are often confused with canine teeth; this is understandable however the two teeth are very different. Wolf teeth as previously explained appear just in front of the cheek teeth, whereas the canine teeth (More common in Male horses) appear closer to the incisor (front) teeth. Wolf teeth appear at around 6 - 12 mths of age, where as Canine teeth usually erupt around 4-6 years of age. Canines are much larger than wolf teeth and require major surgery to extract (remove). This surgery can only be carried out by Veterinarians. Where is Dr Lee right now? We service the entire east coast of Australia (Sydney, Rural New South Wales, Victoria, Queensland and Tasmania) and we also take referrals. Schedule your next appointment with Dr Lee when he next visits your area - use the contact form below. © 2014 -2019 Advanced Equine Dentistry. ALL Rights Reserved.